Tatango launches the industry’s first product designed to actively monitor a business's text messaging programs for known Telephone Consumer Protection Act (TCPA) plaintiffs. Tatango, a leading text message software platform, announced today, the launch of the industry’s first product designed to actively monitor a business's text messaging programs for known Telephone Consumer Protection Act (TCPA) plaintiffs. In the last year 10 years, the number of TCPA lawsuits have increased a staggering 35,614%, with over 5,000 TCPA lawsuits filed last year. Many of these TCPA lawsuits share one thing in common: the plaintiffs. Based on lawsuits examined, 35% of TCPA plaintiffs have sued under so-called consumer-protection statutes in the past. These individuals are commonly referred to as “Professional TCPA Plaintiffs” because they actively solicit TCPA “violations” by subscribing their mobile phone numbers to hundreds, or even thousands, of text messaging programs. Given the astronomical amount of damages being sought by plaintiffs and the expense of defending these frivolous TCPA lawsuits, businesses are seeking tools to proactively protect themselves. The best way a business can protect itself from Professional TCPA Plaintiffs is to never send them text messages in the first place. Tatango’s new TCPA Plaintiff Monitoring product offers a solution to businesses to proactively monitor their text messaging programs for signs of professional plaintiffs. When a known TCPA plaintiff is detected attempting to engage with a business's text messaging program, not only is the business alerted, Tatango’s advanced software automatically blocks all communications with that plaintiff’s mobile phone number. While Tatango doesn’t choose who a business sends text messages to, this new product will help businesses decide who not to text message. 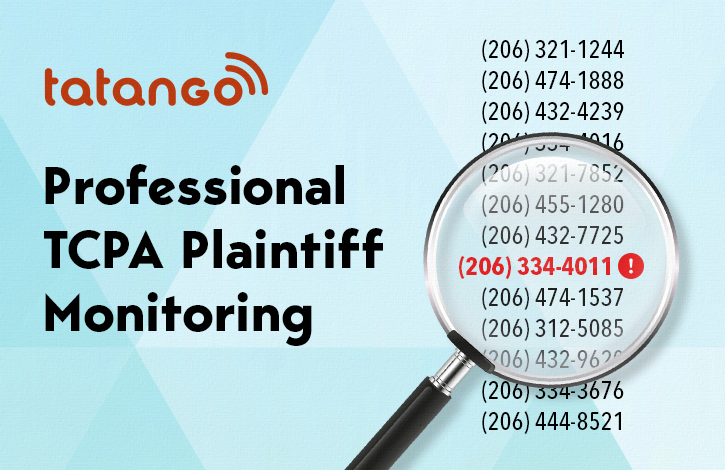 Tatango continually monitors many different sources for TCPA plaintiffs’ mobile numbers. These sources include TCPA lawsuits, FCRA lawsuits, FDCPA lawsuits, Truth in Lending lawsuits, and exclusive litigator, brand and software reporting networks. This makes Tatango’s TCPA Plaintiff Monitoring product the most powerful and comprehensive tool to reduce the risk of frivolous TCPA litigation on the market. Complete product details, including pricing information, can be obtained by contacting Tatango at https://www.tatango.com/contact.